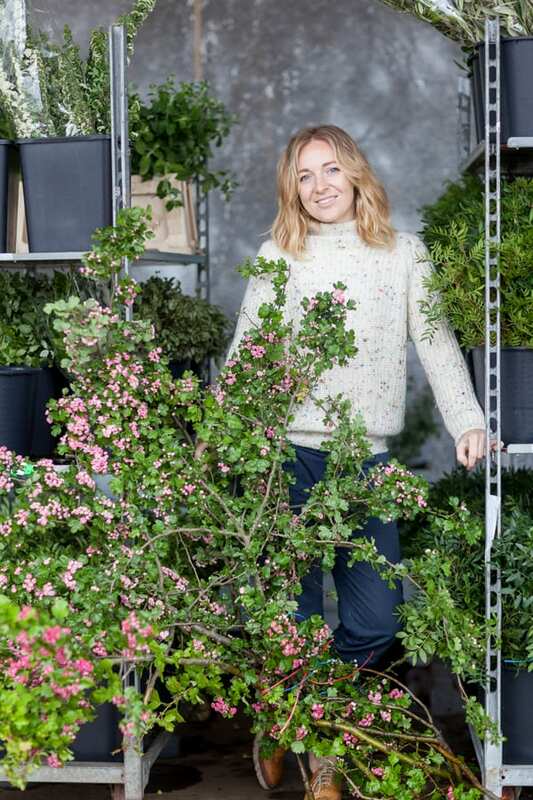 It’s Day Two of British Flowers Week and I’m delighted to share an interview with Florence Kennedy of Petalon, where we chat about her chosen flower, the Orlaya grandiflora. 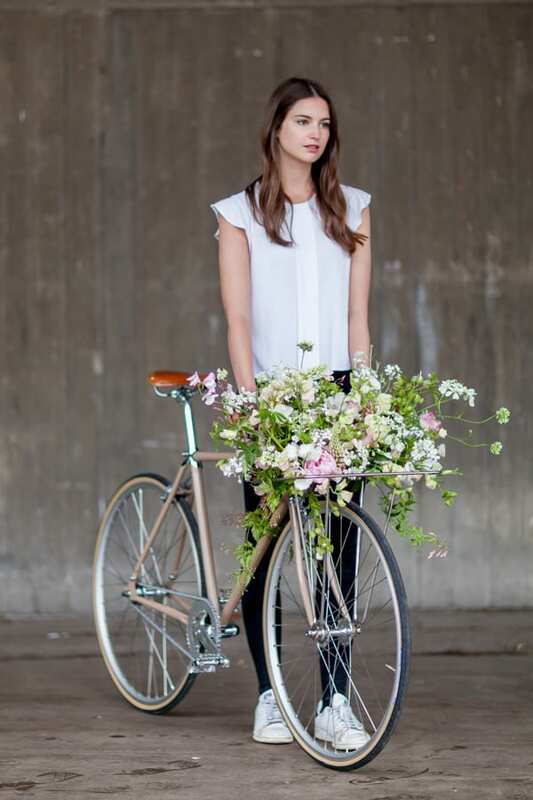 By the way, Florence delivers flowers in London by bicycle, which explains the reason for the theme of her three floral designs! Your chosen flower for British Flowers Week is Orlaya grandiflora. Could you tell us why you selected it? It’s a beautiful, delicate looking flower that adds lovely texture and is much hardier than it looks. I buy them from Zest Flowers, Pratley and DG Wholesale Flowers. Could you tell us about the three designs which you’ve made exclusively for British Flowers Week 2016? I’ve decorated a bicycle helmet and bicycle, plus made a bouquet. 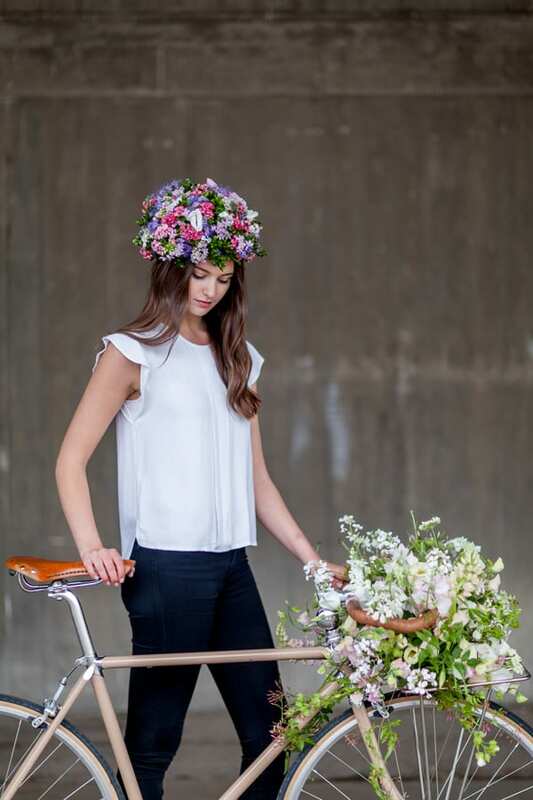 The helmet features sweet rocket, alliums, sweet peas, hawthorn blossom and hebe, whilst the bicycle is decorated with Orlaya grandiflora, lupins, sweet rocket, delphiniums, stocks, jasmine, dog rose and lisianthus. 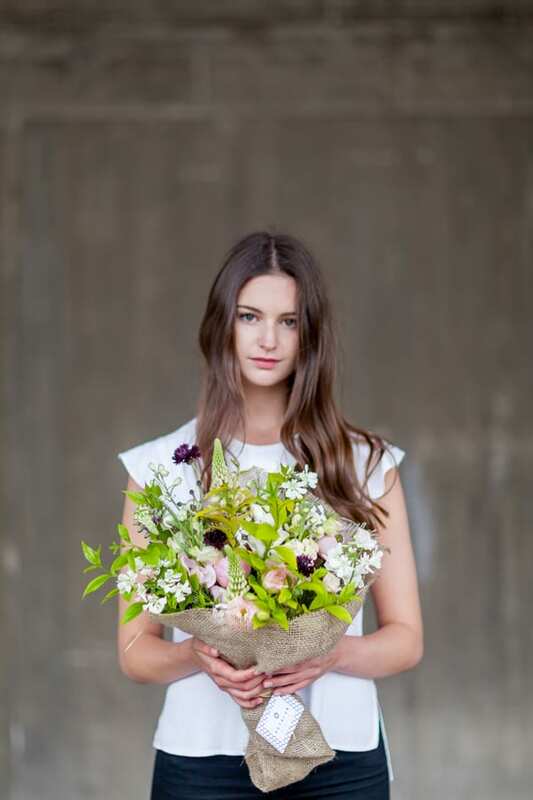 The bouquet features Orlaya grandiflora, lupins, delphiniums, lisianthus, peonies, sweet peas, sweet rocket, black cornflowers, pinks, wild grasses and privet. 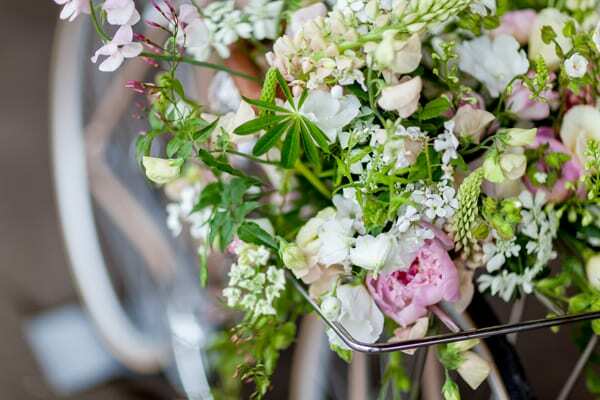 Do you feature British flowers in your ‘Bouquets by Bicycle’? Yes, we usually have at least one British flower in our bouquets. I get a lot of pride buying British and I love that with homegrown blooms, everything is more wild and tendrilly. We have a certain type of customer and they tend to love flowers which are a bit wilder and wonky, rather than dead straight. They want a bunch that looks like someone’s gone out to the garden and grabbed an armful of flowers and foliage. Do you find there are any challenges in using British flowers? Each week, I have two bouquet designs. And on a Monday and Wednesday, I’ll buy the flowers that I need for each of the designs in bulk. There’s sometimes the challenge that particular flowers come in boxes of mixed colours, like lisianthus. I may need to have, for example, 100 stems of one particular colour, like Echo Champagne which is pale pink lisianthus. And currently it’s only available as part of a mixed box. Could you tell us how you’ll be celebrating British Flowers Week ? We’re selling a special all British bouquet called British Blue. 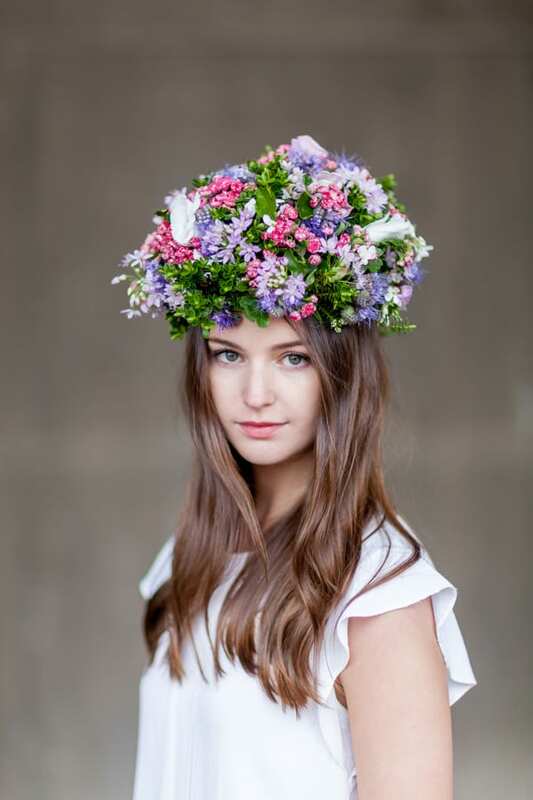 Its ingredients are Orlaya grandiflora, delphinium, peony, cornflower, scabious, astrantia, nigella, sweet pea, rose, lavender, pink, iberis, salvia, privet, hornbeam, rosemary and mint. I’ll be back tomorrow with the third British flower and florist…! P.S. Just in case you missed it, here’s a link to Day One of British Flowers Week.